Trinity Groves Goes Vegan, And East Dallas Welcomes Its New Waffle House. Welcome to The Spread, our weekly feature that aims to share all the area restaurant, food and beverage industry news that's fit to print. Except, this is the Internet, so space isn't a concern. Also: Good thing, because this is Dallas and this town always has breaking restaurant news going down like whoa. For the first time since its inception as a pseudo restaurant theme park, Trinity Groves is getting some legit vegan food. The folks behind vegan-friendly hot-doggery Samson's Hot Dogs are opening V Spot, a vegan comfort food concept, in the former Sugar Skull Cafe space. As first reported by CultureMap, V Spot will be a full-service sit-down restaurant with a menu that builds on the brand's holiday pop-up diners. Also in keeping with the brand, price points are expected to be low, adding cheaper dining options to the area to help draw in millennial consumers. Look out for an opening this spring. Down to the West End, meanwhile, popular food truck Tutta's Pizza is debuting a brick-and-mortar store this weekend. Per Mike Hiller of Escape Hatch, the restaurant offshoot of the mobile pizzeria will double as a live music venue. The grand opening takes place on Saturday, February 20, at 11 a.m., with a performance from Erik Chandler at 9 p.m. 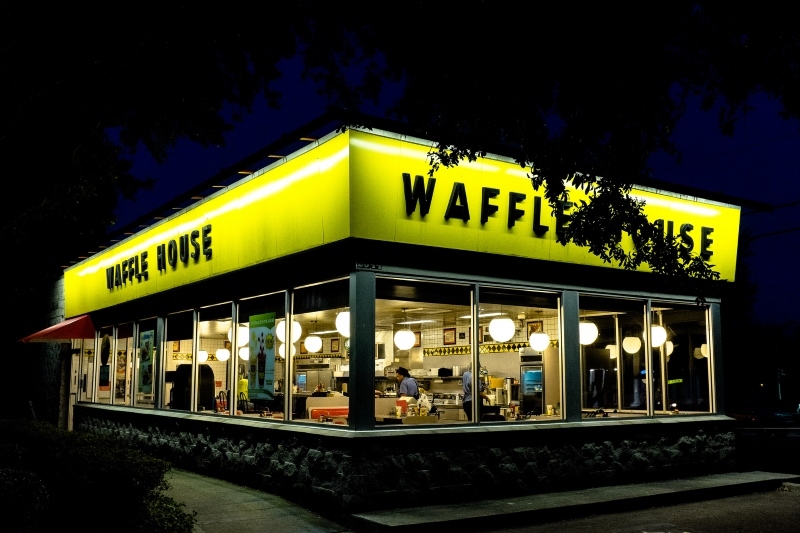 Meanwhile, that East Dallas Waffle House is now officially open over on Ross Avenue. The new outpost marks the most inner-city location for the chain in Dallas, according to Teresa Gubbins of CultureMap, thus adding to the 24-hour breakfast options for the area. In yet more opening news, a concept called Laili plans to join The Shed 2 lineup at the Dallas Farmers Market next month. According to its website, the restaurant draws inspiration from the merging of cultures during the Silk Road trading routes, with a focus on spices and herbs common during the time period. The menu combines aspects of Silk Road-inspired cuisines in modern preparations at a reasonable price range. Sign us up. Back in East Dallas, the recently vacated Cultivar space inside of Good 2 Go Taco will soon be home to Austin's Cow Tipping Creamery, courtesy of Jay Jerrier. The announcement came not long after the Zoli's proprietor broke the heart of pizza-loving Dallasites by closing his Oak Cliff shop. Soft-serve goodies will now be dished out of the historically shared space, joining White Rock's forthcoming Hypnotic Emporium as the area's newest options for ice cream. An opening date has yet to be confirmed. On the opposite end of the spectrum, Lakewood area residents must soon say goodbye to Donut Paradise. The Lakewood Advocate reports that the doughnut shop plans to close its doors on Monday, February 29, due to the owner not wishing to commute after a recent move to Flower Mound. However, the closing is the fourth business to shutter along Gaston Avenue in recent weeks, three of which were under Lincoln Property Company management, including area-favorite Dixie House. Onto craft brew news: Tomorrow, the Trinity River Audubon is hosting a an event called Birds & Brew. The after-hours exhibit features samplings from Nine Band Brewing, Oak Highlands Brewery and Shannon Brewing Co. and a night trail exploration with flashlights. The event starts at 6 p.m.
Also, Bishop Cider Co. is expanding, adding a second cidery to the Brewing District Design District. To celebrate, they're hosting a grand opening party on Saturday, February 27, featuring local bands, food trucks and some new ciders. Finally, Luck is hosting its second annual North Texas craft beer and chili challenge on Sunday, February 21. At least two dozen area breweries have signed up to compete to make a chili using one of their beers, with proceeds benefiting the North Texas Food Bank. If you want to participate in the tastings, a $10 donation will get you 10 cups, a spoon, a raffle entry and a vote in the contest. The event takes place from noon to 5 p.m.
Cover photo via flickr/rpavich. Got a tip for The Spread? Email us!